THIS year’s Lecale Review has been published, with a wide variety of topics from 17th century rebellions to 19th century windmills explored. The Lecale Review is the Lecale and Downe Historical Society’s annual journal, which is published as a resource of local historical information. The society was formed in 2009 from the amalgamation of the Down Society and the Lecale Historical Society, two of Northern Ireland’s most active groups, each with a general interest in the heritage of Lecale and adjacent areas of East Down. The 2011 edition opens with a photographic entry from Alan Johnston entitled Frozen Sea at Strangford — the unusually frozen Lough was captured on Christmas Eve 2010. The Review continues with Colm Rooney’s brief history of the De Ros family, and how the oldest title in the English peerage came to be linked to Strangford. mainly due to greatly increased demand for cereals in the period prior to and during the Napoleonic wars. The Cuan 1911-2011 — the life and times of an Old Irish Inn by Colm Rooney, marks the 200 anniversary of this Strangford institution. Run by the Sharvin family since 1811 and for the last 20 years by Peter and Caroline McErlean, this study examines the food and drink prices of the time, and the later problems caused by the Temperance movement. By the early 1900s, however, Sharvins, as it was known then, was in its heyday. 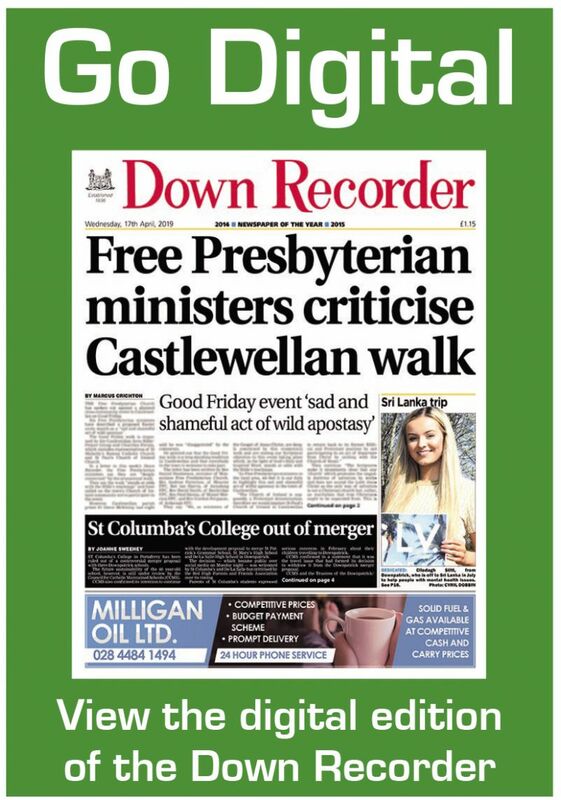 Other articles in this year’s Lecale Review include The 1641 Rebellion in Down, by Michéal Mac Ardgháil, St. Patrick’s Legacy, by Michael Ryan, Downpatrick Masonic Hall, by Philip Blair, marking the 250th anniversary of the Freemasonry in Downpatrick, and Excavations at Blundell’s House, Dundrum Castle, by Philip McDonald. Membership of the Lecale and Downe Historical Society is open to all who subscribe to its aims. Members are entitled to attend the lecture programme and other events organised by the society. Individual membership subion is £10 per year and family membership is £15. Contact Philip Blair, 6 Monabot Road, Downpatrick, BT30 6PJ. The society’s journals are also available for sale. The Society has reproduced the full set of the first 20 journals of the Lecale Historical Society (1998-2002) called ‘Lecale Miscellany’ on CD-ROM. The price is £10 plus postage.